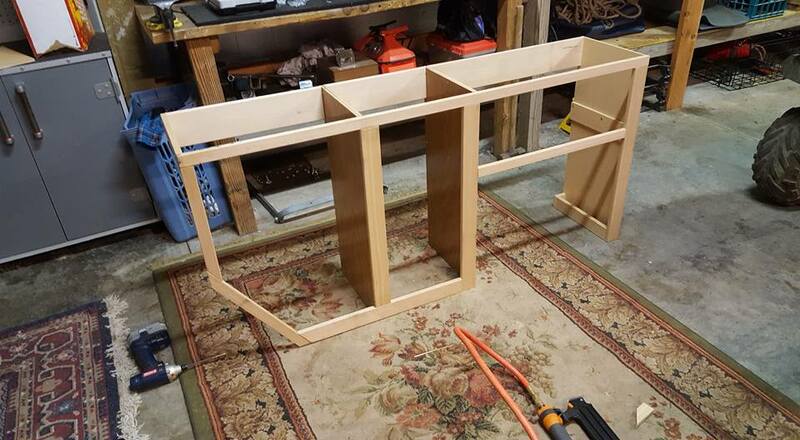 I had built the cabinets for my previous Vanagon out of 3/4" plywood - three sheets of it. To say the least, they weighed a ton! I learned some valuable lessons about how to build cabinets and what I needed in this next version. I wanted these new cabinets to weigh far less than the last ones, this was a high priority. When I go backpacking I try to keep my load as light as possible, it helps make the trip easier and forces simplicity - this definitely translates to the Vanagon build. To start I hit my father up for spare building materials he had around his shop. I was able to build the face frame and the majority of the structure with pieces he had. The sides were made of reclaimed plywood he had saved from another project, and the face frame with hemlock he had sitting around for years. The rest of the cabinet (top and doors) is made from domestically grown, sustainably harvested birch trees, turned into 1/2" plywood. The wood is beautiful, and the end product is much lighter than last time. My previous cabinets had a built in sink - which never got used - so this time I have started without one. I am still waiting to get my hands on some Safecoat ployureseal, a non-toxic wood sealer. Looks awesome now! So clean and fresh. Great choice on the flooring and the cabinets…now if only you had curtains for those windows ?